on the baby's face are highlighted in yellow. 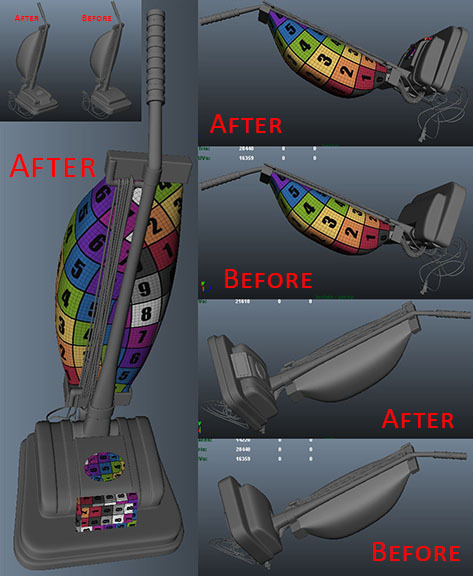 This is something that I've been considering doing for some time now because the head of the vacuum was looking much too plain to me. I kept telling myself that it was okay: much of that part of the vacuum is hidden behind the apron and under the Juggler's other objects, but I just couldn't let go of the idea that I should improve upon it. My first idea - the one that nagged at me more than anything else - was that a vacuum should have a headlamp. I know that this is probably a silly notion, because most of the vacuums that I see these days don't have headlamps anymore, but the vacuum that I grew up with had one, so it's stuck in my head as a standard element of vacuum cleaners - especially bag vacuum cleaners. Once I added the headlamp it occurred to me to add a few more plane breaks to the geometry of the vacuum head; as it was, the head was looking more or less like two blocks stacked on top of one another. I added the grooves and the extra rim, and then, to finish the whole thing off, I gave it a little plaque in which I plan to sculpt a unique brand logo. I then UVed those portions of my additions that will need maps applied and exported the OBJs. I don't even know how many hours I spent looking at those prongs holding the large diamond in place - I must have redone them at least five times, sometimes with painstakingly slow processes. I got the front view - the angle that blends into the wording - of the first two prongs done first, then I bowed them out forward by rotating them a bit in the side view. I thought that would be the end of it, but when I switched cameras back to the perspective view, I saw that rotating them forward had completely messed up my front view. I was expecting that the front view might get a little squished looking with the rotation (and prepared to fix it if it did), but instead the geometry looked twisted. It took me a little while to figure out why rotating it in only one direction would cause it to look twisted, but eventually it made sense and the only way that I could see to fix it was to line the geometry back up by hand, one row of vertices at a time. Once I got the prong coming up off of the "y" fixed I copied it in reverse to the other side and attached it to the "m". Then I copied and attached both prongs to the back side of the ring. Then I moved onto the prongs holding the sides of the diamond in place. I duplicated the faces of one of the prongs - and, yes, I was foolish enough to attach all of the prongs to the base, then realize that I still wanted to duplicate them more, so that, instead of duplicating an object, I had to take time to select and duplicate faces - and rotated it 90 degrees. Only then did I realize that I needed the side prongs straight rather than bowed off at an angle like my front ones were. I should have just made new geometry when I realized my error, but instead I decided to select and center each edge ring one at a time to ensure that the tapering width of the side prongs remained consistent with the taper of the front ones. I have no excuse for this decision. I don't know what I was thinking - clearly, I wasn't. It took much longer to move all of the vertices by hand than it would have done to just make new geometry with a similarly tapering width to the front prongs. Especially when one does the whole thing twice... In the beginning of the process of centering all of the edge rings I was attempting something that I thought might speed the process along, but it didn't seem to be working. Only after I finished lining everything up in the orthographic side view did I look at another view and realize that those early attempts had messed things up from a different direction, and sorting the mess out would have taken much more time than redoing all of the work I'd just done, so I "Ctrl+Z"-ed about as far back as I could go and did it all again. Then I made the diamond. That's right. That's what I wrote. I made the casing (which didn't have to be a particular shape), and then I made the contents. Do you see my error? Because I do - it's glaringly obvious to me now... I ended up having to go back and make adjustments to all the prongs that I thought I'd finished in order to fit a diamond inside of them. Granted, I did use a lot of duplications with transformations for the prongs that mirrored one another, so I didn't fix each and every prong individually, but I had to reposition a lot of the vertices that I had just finished placing by hand, not to mention the cycle of deleting faces only to reattach the newly copied, altered geometry in its place. 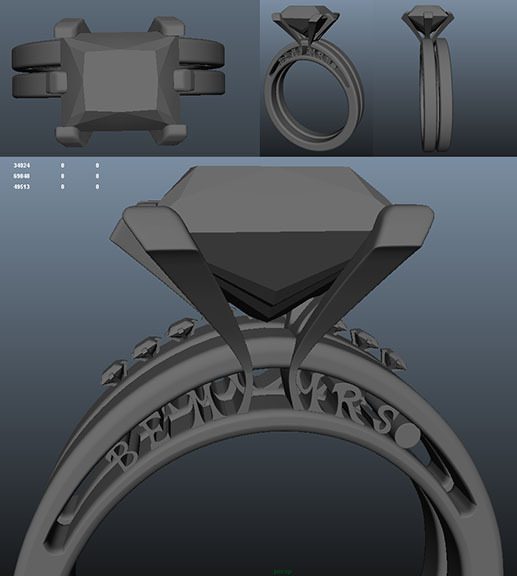 I made a lot of errors with these rings (technically there are two: the single-diamond engagement ring and the multi-diamond wedding ring), but hopefully the experience has impressed some important points into my head, such as the idea that tweaking existing geometry that is not working properly is not always more time-efficient than starting over. If it comes down to moving a large number of vertices point-by-point - or even loop-by-loop - to fix something, it's probably quicker just to start from scratch. Even more importantly: "build the diamond before you build the setting;" or "build the character before the clothes;" or whatever other situation this analogy applies to. 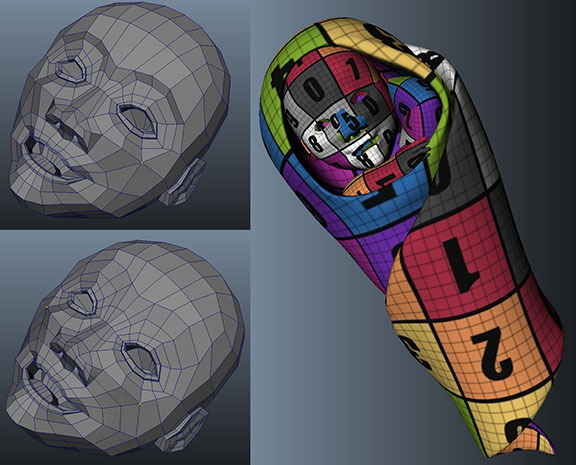 "Never build a casing for an object without the object that the casing fits around." It's a good rule to remember.